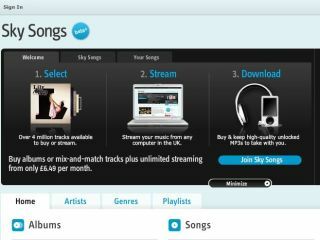 Sky has announced that it has signed up yet another label to its Sky Songs music streaming service. The label is Merlin, and it's a significant coup for Sky has its music platform has been lacking in indie music, pitching itself more as a mainstream version of Spotify. The Merlin catalogue makes up around 10 per cent of the music on Spotify, so Sky will be extremely pleased that is has now got its hands on the likes of Franz Ferdinand and Animal Collective whose labels all come under the Merlin Umbrella. Sky Songs was launched in October with the backing of all the major music distributors. It is a subscription-based service, with two all-you-can-eat versions available. For £6.49-a-month you get 10 songs to download or one £6.49 album; for £7.99 you get 15 songs or a £7.99 album. This is coupled with unlimited monthly streaming. So far, Sky hasn't announced how many people have signed on to Sky Songs but it has revealed it has 4 million song available to listen to now. Got to songs.sky.com for more details.